As we near the holiday shopping rush around, Google is updating its Maps and Shopping products to help consumers navigate crowded malls and stores, as well as research and buy toys online. This year, Google Maps for Android will now include indoor floor plans of a number of stores. These include labels of where certain items are located (kids, mens, juniors, etc.) You can also see maps of malls and easily locate the food court or closest restroom. For some malls, you can get indoor walking directions to find the best route from one store to the next. The indoor maps are available for a number of popular retail locations including Nordstrom, Macy’s, Bloomingdale’s, Harrod’s, Selfridges, John Lewis and other retailers. After launching social reviews on Google Shopping yesterday, the search giant is bring a few more features to the mix to help consumers shop more efficiently online. 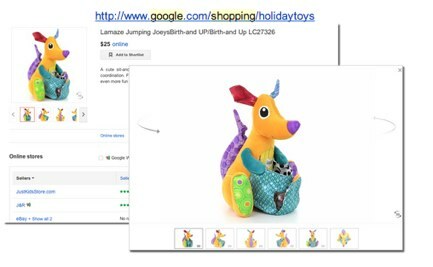 Now when searching for toys, you can see 360-degree photos of the products, which is meant to bring that in-store feeling of holding and touching a product to the online experience. You simply click the “3D” swivel icon on the product image to see the toy in 360-degree view, on HTML5 enabled browsers. You can also access Google’s holiday toy picks as well. If you have a large number of gifts to buy this season, shortlists will help you manage this. Shortlists allows you to keep track of products you like from Google Shopping and across the web; view product photos, prices, and specs side by side, and more. You can also share your shortlist with friends and family. Additionally, Google Shopping now shows discounts or promotions on the products you’re viewing. If discounts or promotions are available, you can click on the link and visit the retailer’s site to redeem the offer.